For the last two days, I was at the kickoff for the COMMIT/ Program – a major computer science (i.e. ICT) research initiative in the Netherlands (110 million euros in funding). The entire program has 15 projects covering most of the major hot topics in computer science everything from sensor networks to large scale data management. It involves 76 partners both academic and industrial. The event itself was attended by ~220 people. I’m involved in COMMIT/ as part of the Data2Semantics project where we’re developing approaches that enable scientists to more easily publish, share and reuse data. to encourage participants to think beyond traditional academic output. With respect to 1, the the leaders of COMMIT/ are trying to create a cohesive program and not just a bunch of separate projects that happened to be funded by the same source. This is going to be a hard task but the kickoff was a good start. The event focused extensively on networking exercises, for example, developing demonstrator ideas with other mixed groups of partners. In addition, they gave out t-shirts which is always a good way to create cohesion 🙂 Indeed, the theme of the event was try to position COMMIT/ as an unfolding story. During one session of lightening talks, I drew the above picture trying to capture a quick visual summary of each project and the common themes across them: health, scale, storytelling. With respect to 2, it’s clear that one of the main goals of the program is to have impact in the world beyond academia. This was shown by the emphasis on research communication to the outside world. I attended a fantastic workshop on visual storytelling given by Onno van der Venn from Zeeno. In addition, there was emphasis placed on creating companies or helping develop products within the existing companies within the various projects. A number support opportunities were discussed. 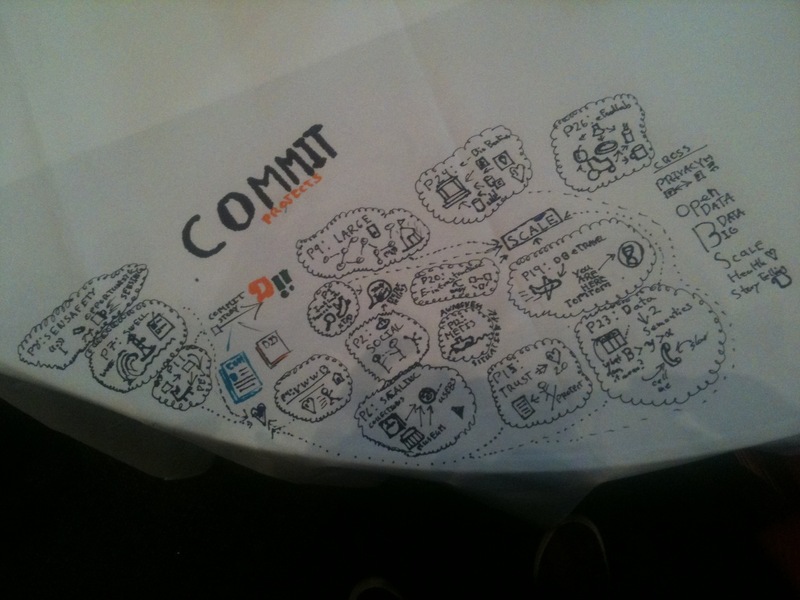 The event was well organized and it was great to be able to network under the COMMIT/ banner. The program is just beginning so it will be interesting to see how the story progresses whether indeed these various already big projects can be brought together.